Giro, Tour, and Vuelta results are on their own pages. Sunday, October 25: Japan Cup (HC), 151.3 km. Thursday, October 15: Giro Del Piemonte (HC), 184 km. Italy. 2. Daniel Moreno (Caisse d'Epargne) s.t. 3. Francesco Gavazzi (Lampre) s.t. 4. Luca Paolini (Acqua & Sapine) s.t. 6. Paul Martens (Rabobank) s.t. 8. Gerben Lowik (Vacansoleil) s.t. 9. Dries Devenyns (Quick Step) s.t. 10. Pablo Lastras Garcia (Caisse d'Epargne) s.t. 11. Alessandro Ballan (Lampre) s.t. 12. Nicolas Roche (Ag2r) s.t. 13. Santo Anza (ISD) s.t. 14. Nico Sijmens (Cofidis) s.t. 15. Enrico Gasparotto (Lampre) s.t. Saturday, October 17: 6th and final stage, Melbourne Circuit Race. 4.1 km circuit. 80 minutes plus 3 laps. 2. Michael Matthews (Jayco AIS) s.t. 3. David Tanner (Rock Racing) s.t. 4. Aaron Kemps (Rock Racing) s.t. 5. Jaan Kirsipuu (LeTua) s.t. 6. Jonny Clarke (Jelly Belly) s.t. 7. Rhys Pollack (Drapac Porsche) s.t. 8. Darren Rolfe (Fly V Australia) s.t. 9. Bradley Wiggins (Garmin-Slipstream) s.t. 10. Bernard Van Ulden (Jelly Belly) s.t. 9. Philip Zajicek (Fly V Australia) s.t. Thursday, October 15: Stage 4, Anglesea - Barwon Heads, 138 km. 2. Jonathan Cantwell (Fly V Australia) s.t. 3. Bradley Wiggins (Garmin-Slipstream) s.t. 6. Dean Downing (Rapha-Condor) s.t. 7. Mitchell Pearson (Prime Estate) s.t. 8. Leigh Howard (Jayco AIS) s.t. 9. David Tanner (Rock Racing) s.t. 10. Matthew Rice (Jelly Belly) s.t. 9. Ben Jacques-Maynes (Bissell) s.t. 4. Tom Peterson (Garmin-Slipstream) s.t. 5. Bradley Wiggins (Garmin-Slipstream) s.t. 6. Mitchell Pearson (Prime Estate) s.t. 7. Leigh Howard (Jayco AIS) s.t. 9. Peter Latham (Bissell) s.t. 10. Philip Zajicek (Fly V Australia) s.t. Tuesday, October 13: Stage 2, Colac - Warrnambool, 141 km. 3. Matthew Wilson (Jayco Australia National) s.t. 4. David Pell (Savings and Loans) s.t. 10. Ben Jacques-Maynes (Bissell) s.t. Monday, October 12: Stage 1, Ballarat - Ballarat, 149 km. 2. Chris Sutton (Garmin-Slipstream) s.t. 3. Jonathan Cantwell (Fly V Australia) s.t. 5. David Pell (Savings and Loans) s.t. 7. Matthew Wilson (Jayco Australia National) s.t. 8. David Tanner (Rock Racing) s.t. 9. Richard Lang (Budget Forklifts) s.t. 10. Mitchel Pearson (Prime Estate) s.t. 6. Joe Lewis (Drapac Porsche) s.t. 8. David Pell (Savings and Loans) s.t. 9. Matthew Wilson (Jayco Australia National) s.t. 10. David Tanner (Rock Racing) s.t. Sunday, October 11: Preface, Ballarat Criterium, 44 km. 3. Gene Bates (Drapac Porsche) s.t. 4. Michael Matthews (Jayco AIS) s.t. 6. David Tanner (Rock Racing) s.t. 7. Michael England (Budget Forklifts) s.t. 9. Darren Lapthorne (Rapha-Condor) s.t. 10. Kiel Reijnen (Jelly Belly) s.t. 2. Giovanni Visconti (ISD) s.t. 3. Enrico Rossi (Flaminia) s.t. 4. Luca Paolini (Acqua & Sapone) s.t. 5. Dario Cataldo (Quick Step) s.t. 6. Luca Mazzanti (Katusha) s.t. 7. Krzystof Szczawinski (Miche) s.t. 8. Andrea Moletti (Miche) s.t. 9. Damiano Cunego (Lampre) s.t. 10. Daniele Callegarin (Centri Della Calzattura) s.t. 11. Marcello Pavarin (CSF) s.t. 12. Paolo Longo Borghini (Barloworld) s.t. 13. Craig Lewis (Columbia) s.t. 14. Fabian Wegmann (Milram) s.t. 15. Fabrice Piemontesi (Fuji-Servetto) s.t. 3. Leonardo Bertagnolli (Serramenti PVC-Diquigiovanni) s.t. 4. Davide Malacarne (Quick Step) s.t. 5. Miguel Angel Rubiano (Centri Della Calzatura) s.t. 6. Domenico Pozzovivo (CSF) s.t. 7. Marcello Pavarin (CSF) s.t. 8. Alessandro Bertolini (Serramenti PVC-Diquigiovanni) s.t. 9. Luca Mazzanti (Katusha) s.t. 10. Luca Solari (Serramenti PVC-Diquigiovanni) s.t. 13. Cadel Evans (Silence-Lotto) s.t. 2. Juan Jose Haedo (Saxo) s.t. 3. Alexandre Usov (Cofidis) s.t. 4. Roger Hammond (Cervelo) s.t. 5. Sebastien Chavanel (FDJ) s.t. 6. Sebastien Hinault (Ag2r) s.t. 7. Andreas Dietziker (Vorarlberg) s.t. 8. Martin Reimer (Cervelo) s.t. 10. Romain Feillu (Agritubel) s.t. 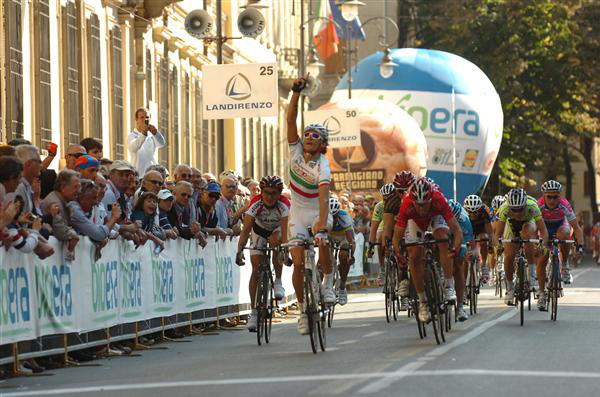 Saturday, October 3: Memorial Cimurri - Gran Premio Bioera, 191.5 km (1.1), Italy. 3. Daniele Colli (Carmiooro) s.t. 4. Mikhaylo Khalilov (Flaminia) s.t. 5. Johannes Frohlinger (Milram) s.t. 6. Giovanni Visconti (ISD) s.t. 7. Volodymyr Starchyk (Amore & Vita) s.t. 8. Enrico Gasparotto (Lampre) s.t. 9. Matteo Tosatto (Quick Step) s.t. 10. Simon Clarke (ISD) s.t. Sunday, October 4: 4th and Final Stage, Grand Place de Mons - Tournai, 147.1 km. 2. Yauheni Hutarovich (FDJ) s.t. 3. Roger Hammond (Cervelo) s.t. 4. Danilo Napolitano (Katusha) s.t. 5. Stefan Van Dijk (Verandas Willems) s.t. 6. Roy Sentjens (Silence-Lotto) s.t. 7. Tom Veelers (Skil-Shimano) s.t. 8. Alexandre Usov (Cofidis) s.t. 10. Mathew Hayman (Rabobank) s.t. 8. Stefan Van Dijk (Verandas Willems) s.t. 9. Alexandre Usov (Cofidis) s.t. 10. Yauheni Hutarovich (FDJ) s.t. 11. Mathew Hayman (Rabobank) s.t. 12. Assan Bazayev (Astana) s.t. 13. Sergey Lagutin (Vacansoleil) s.t. 14. Frederic Guesdon (FDJ) s.t. 17. Klaas Lodewyck (Topsport Vlaanderen) s.t. 18. Renaud Dion (Ag2r) s.t. 20. Wim De Vocht (Vacansoleil) s.t. 2. Roger Hammond (Cervelo) s.t. 3. Tyler Farrar (Garmin-Slipstream) s.t. 4. Assan Bazayev (Astana) s.t. 6. Mathew Hayman (Rabobank) s.t. 7. Stefan Van Dijk (Verandas Willems) s.t. 9. Yauheni Hutarovich (FDJ) s.t. 10. Danilo Napolitano (Katusha) s.t. 1. Tyler Farrar (Garmin-Slipstream) 15hr 5min 4sec. 40.923 km/hr so far. 9. Mathew Hayman (Rabobank) s.t. 10. Assan Bazayev (Astana) s.t. Friday, October 2: Stage 2, Maubeuge - Poperinge, 225.7 km. 2. Alexandre Usov (Cofidis) s.t. 3. Jimmy Casper (Besson Chaussures) s.t. 4. Tom Veelers (Skil-Shimano) s.t. 6. Baptiste Planckaert (Landbouwkrediet) s.t. 7. Roy Sentjens (Silence-Lotto) s.t. 8. Klaas Lodewyck (Topsport Vlaanderen) s.t. 9. Reinier Honig (Vacansoleil) s.t. 10. Stefan Van Dijk (Verandas Willems) s.t. 1. Tyler Farrar (Garmin-Slipstream) 11hr 12min 31sec. 39.193 km/hr average speed so far. 4. Alexandre Usov (Cofidis) s.t. 7. Jimmy Casper (Besson Chaussures) s.t. 8. Renaud Dion (Ag2r) s.t. 9. Cedric Coutouly (Besson Chaussures) s.t. 2. Danilo Napolitano (Katusha) s.t. 4. Juan Jose Haedo (Saxo) s.t. 5. Mathew Hayman (Rabobank) s.t. 7. Jonas Vangenechten (Verandas Willems) s.t. 8. Roger Hammond (Cervelo) s.t. 9. Jimmy Casper (Besson Chaussures) s.t. 10. Klaas Lodewyck (Topsport Vlaanderen) s.t. 4. Renaud Dion (Ag2r) s.t. 5. Cedric Coutouly (Besson Chaussures) s.t. 7. Steven De Jongh (Quick Step) s.t. 10. Kevin Hulsmans (Quick Step) s.t. Sunday, September 6: Giro della Romagna (1.1), 195.6 km. Italy. 2. Enrico Rossi (Flaminia) s.t. 4. Francesco Ginanni (Serramenti PVC-Diquigiovanni) s.t. 5. Daniele Colli (Carmiooro) s.t. 7. Federico Canuti (CSF) s.t. 8. Miguel Angel Rubiano (Centri della Calzatura) s.t. 9. Fabrice Piemontese (Fuji-Servetto) s.t. 10. Daniele Pietropolli (LPR) s.t. 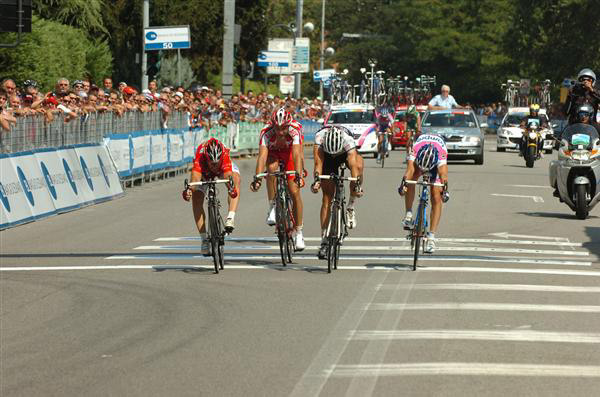 Saturday, August 29: Giro del Veneto (HC), 199.6 km. Italy. 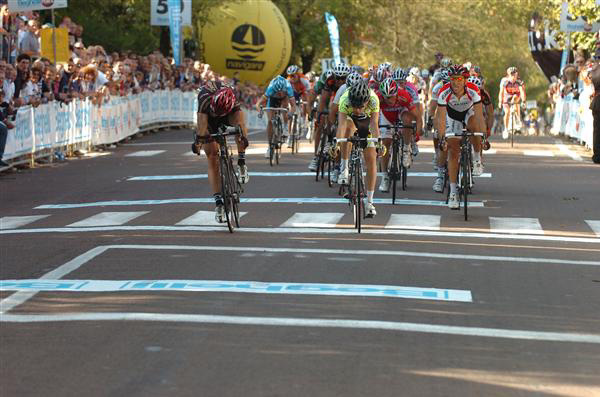 2009 Giro del Veneto results. August 29 - August 30, US Cycling Professional Championships at Greenville, N.C.
5. Matthew Busche (Kelly Benefit) s.t. 7. Chris Jones (Team Type 1) s.t. 5. Reid Mumford (Kelly Benefit) s.t. Friday, August 28: 5th and Final stage, Atlansevre - Poitiers, 186.9 km. 2. Michel Kreder (Rabobank Continental) s.t. 3. Jeremie Galland (Besson Chaussures) s.t. 4. Fabien Bacquet (Auber 93) s.t. 5. Alexandre Pichot (Bouygues Telecom) s.t. 6. Sergio Henao (Colomia Espoirs) s.t. 7. Jean-Luc Delpech (Bretagne) s.t. 8. Steven Caethoven (Agritubel) s.t. 9. Nicolas Roche (Ag2r) s.t. 10. Frederic Amorisson (Landbouwkrediet) s.t. Thursday, August 27: Stage 4, Monts Sur Guesnes - Loudon, 98.5 km. 3. Christophe Le Mevel (FDJ) s.t. 5. Jimmy Casper (Besson Chaussures) s.t. 6. Jerome Cousin (Bouygues Telecom) s.t. 7. Nadir Haddou (Auber 93) s.t. 8. Jean-Luc Delpech (Bretagne) s.t. 9. Brett Lancaster (Cervelo) s.t. 10. Boy Van Poppel (Rabobank Continental) s.t. Thursday, August 27: Stage 3, Monts Sur Guesnes 22.6 km Individual Time Trial. 5. Dries Devenyns (Quick step) s.t. 2. Thor Hushovd (Cervelo) s.t. 3. Guillaume Blot (Cofidis) s.t. 5. Steven Caethoven (Agritubel) s.t. 6. Fabien Bacquet (Auber 93) s.t. 7. Michel Kreder (Rabobank Continental) s.t. 8. Lilian Jegou (Bretagne) s.t. 9. Nicolas Rousseau (Ag2r) s.t. 10. Jean-Luc Delpech (Bretagne) s.t. 2. Sebastien Joly (FDJ) s.t. 3. Jerome Pineau (Quick step) s.t. 4. Loic Desriac (Ag2r) s.t. 5. Michael Stevenson (Sparebanken Vest) s.t. 8. Guillaume Blot (Cofidis) s.t. 9. Fabien Bacquet (Auber 93) s.t. 10. Nadir Haddou (Auber 93) s.t. 9. Guillaume Blot (Cofidis) s.t. 10. Fabien Bacquet (Auber 93) s.t. Sunday, August 23: GP Ouest-France (Pro Tour), 229.2 km. France. 4. Ivan Basso (Liquigas) s.t. 5. Giampaolo Caruso (Flaminia) s.t. Sunday, August 23: 3rd and Final Stage, Bantry - Cork, 168.9 km. 2. Russell Downing (Candi TV) s.t. 4. Craig Lewis (Columbia) s.t. 5. Alexander Kolobnev (Saxo) s.t. 6. Mathias Frank (BMC) s.t. 7. Steven Kruijswijk (Rabobank) s.t. 8. Marco Pinotti (Columbia) s.t. 9. Karsten Kroon (Saxo) s.t. 10. Denys Kostyuk (ISD) s.t. 9. Denys Kostyuk (ISD) s.t. 10. Jakob Fuglsang (Saxo) s.t. Saturday, August 22: Stage 2, Clonmel - Killarney, 195.8 km. 3. Stuart O'Grady (Saxo) s.t. 4. Alexander Kristoff (Joker) s.t. 5. Steven Van Vooren (An Post) s.t. 6. Martin Reimer (Cervelo) s.t. 7. Ian Wilkinson (Halfords) s.t. 8. Christoff Van Heerden (MTN) s.t. 9. Pierpaolo De Negri (ISD) s.t. 10. Juan Van Heerden (MTN) s.t. 76. Lance Armstrong (Astana) s.t. 6. Haimar Zubeldia (Astana) s.t. 7. Frederik Wilman (Joker) s.t. 3. Matti Breschel (Saxo) s.t. 4. Philip Deignan (Cervelo) s.t. 5. Haimar Zubeldia (Astana) s.t. 6. Marco Pinotti (Columbia0 s.t. 8. Oleksandr Kvachuk (ISD) s.t. 23. Lance Armstrong (Astana) s.t. 6. Marco Pinotti (Columbia) s.t. 2. Danilo Hondo (PSK) s.t. 3. Enrico Gasparotto (Lampre) s.t. 4. steve Cummings (Barloworld) s.t. 5. Geraint Thomas (Barloworld) s.t. 6. Enrico Magazzini (Lampre) s.t. 7. Mauro Finetto (CSF) s.t. 9. Giovanni Visconti (ISD) s.t. Sunday, August 23: 5th and Final Stage, Salt Lake Downtown Criterium, 75 km. 2. John Murphy (OUCH) s.t. 3. Chris Barton (BMC) s.t. 5. Darren Lill (Team Type 1) s.t. 6. Bjorn Selander (Trek-Livestrong) s.t. 8. Roman Van Uden (Land Rover) s.t. 9. Tyler Wren (Colavita) s.t. 10. Francisco Mancebo (Rock Racing) s.t. Saturday, August 22: Stage 4, Park City - Snowbird, 155 km (96 miles). 5. Glen Chadwick (Rock Racing) s.t. 10. Matthew Busche (Kelley Benefit) s.t. Friday, August 21: Stage 3, Miller Motorsport 14.5 km (9.2 miles) Individual Time Trial. 10. Chris Barton (BMC) s.t. 8. Patrick McCarty (OUCH) s.t. Thursday, August 20: Stage 2, Thanksgiving Point - Mt. Nebo, 124 km (77 miles). 4. Patrick McCarty (OUCH) s.t. 6. Anthony Colby (Colavita) s.t. 5. Patrick McCarty (OUCH) s.t. 2. Oscar Sevilla (Rock Racing) s.t. 4. Victor Hugo Pena (Rock Racing) s.t. 5. David Clinger (Cole Sport) s.t. 6. Alex Howes (Holowesko) s.t. 7. Alexander Hagman (Ciclismo) s.t. 8. Darren Lill (Team Type 1) s.t. 9. Bjorn Selander (Trek-Livestrong) s.t. 10. Moises Aldape (Team Type 1) s.t. Tuesday, August 18: Prologue, Salt Lake City 4.5 km (2.8 mile) Individual Time Trial. 3. Ian McKissick (BMC) s.t. 7. Francisco Mancebo (Rock Racing) s.t. 2. Mauro Santambrogio (Lampre) s.t. 3. Francisco Jose Ventoso (Carmiooro) s.t. 4. Alessandro Bertolini (Serramenti PVC-Diquigiovanni) s.t. 5. Miguel Rubiano (Centri della Calzatura) s.t. 6. Michele Scarponi (Serramenti PVC-Diquigiovanni) s.t. 9. Philipp Mamos (Amore & Vita) s.t. 10. Manuele Mori (Lampre) s.t. 2. Pierrick Fedrigo (Bouygues Telecom) s.t. 3. Paul Martens (Rabobank) s.t. 4. Florian Vachon (Roubaix) s.t. 5. Sebastien Hinault (Ag2r) s.t. 6. Cedric Coutouly (Besson Chaussures) s.t. 7. Xavier Florencio (Cervelo) s.t. 9. Samuel Dumoulin (Cofidis) s.t. 10. Sebastien Chavanel (FDJ) s.t. 5. Thomas Voeckler (Bouygues Telecom) s.t. 2. Mathieu Perget (Caisse d'Epargne) s.t. 4. Lilian Jegou (Bretagne) s.t. 5. Xavier Florencio (Cervelo) s.t. 6. Koos Moerenhout (Rabobank) s.t. 7. Bjorn Leukemans (Vacansoleil) s.t. 8. Thomas Voeckler (Bouygues Telecom) s.t. 9. Sylvain Calzati (Agritubel) s.t. 10. Cyril Gauthier (Bouygues Telecom) s.t. 9. Koos Moerenhout (Rabobank) s.t. 2. Romain Feillu (Agritubel) s.t. 3. Sebastien Chavanel (FDJ) s.t. 4. Mickael Larpe (Roubaix) s.t. 5. Tom Leezer (Rabobank) s.t. 6. Peter Wrolich (Milram) s.t. 8. Jimmy Engoulvent (Besson Chaussures) s.t. 9. Paul Martens (Rabobank) s.t. 10. Florian Vachon (Roubaix) s.t. 4. Romain Feillu (Agritubel) s.t. 6. Thomas Voeckler (Bouygues Telecom) s.t. 2. Xavier Florencio (Cervelo) s.t. 4. Benoit Sinner (Besson Chaussures) s.t. 5. Jeremie Galland (Besson Chaussures) s.t. 6. Nadir Haddou (Auber 93) s.t. 7. Sebastien Hinault (Ag2r) s.t. 8. Tom Leezer (Rabobank) s.t. 8. Jeremie Galland (Besson Chaussures) s.t. 9. Nadir Hadou (Auber 93) s.t. 10. Sebastien Hinault (Ag2r) s.t. 2. Martin Pedersen (Capinordic) s.t. 3. Cyril Lemoine (Skil-Shimano) s.t. 4. Jurgen Roelandts (Silence-Lotto) s.t. 5. Jempy Drucker (Differdange) s.t. 5. Marco Marzano (Lampre) s.t. 8. Giampaolo Cheula (Barloworld) s.t. Saturday, August 8: GP Citta di Camaiore (1.1), 188.1 km. Italy. 3. Massimo Giunti (Miche) s.t. 4. Giampaolo Caruso (Flaminia) s.t. 6. Daniele Colli (Carmiooro) s.t. 7. Daniele Callegarin (Centri Della Calzatura) s.t. 8. Jure Kocjan (Carmiooro) s.t. 9. Daniele Pietropolli (LPR) s.t. 10. Francsco Ginanni (Serramenti PCV-Diquigiovanni) s.t. Thursday, August 6: GP Industria e Commercio Artigianato Carnaghese (1.1), 185.4 km. Italy. 2. Daniele Callegarin (Centri della Calzatura) s.t. 3. Giovanni Vissconti (ISD) s.t. 4. Fortunato Baliani (CSF) s.t. 6. Daniele Pietropolli (LPR) s.t. 7. Jure Kocjan (Carmiooro) s.t. 8. Manuel Belletti (Serramenti PVC-Diquigiovanni) s.t. 9. Luis Angel Mate (Serramenti PVC-Diquigiovanni) s.t. 10. Maurizio Biondo (Flaminia) s.t. Thursday, August 6: Second and Final Stage, Tulle - Chaumeil (Bol d'Or des Monedieres), 147.6 km. 5. Fredrick Ericsson (Capinordic) s.t. 6. Francisco Ventoso (Carmiooro) s.t. 10. Mathieu Ladagnous (FDJ) s.t. 6. Frederik Willman (Joker) s.t. Wednesday, August 5: Stage 1, St. Amand Montrond - Besse, 194.2 km. Stage and GC times and placings are the same. 6. Guillaume Laverlet (FDJ) s.t. 7. Julien Loubet (Ag2r) s.t. 8. Maxime Mederel (Auber 93) s.t. 9. Pierre Cazaux (Roubaix) s.t. Saturday, August 8: 7th and Final Stage, Rabka Zdroj - Krakow, 136.6 km. 3. Wouter Weylandt (Quick Step) s.t. 4. Matthew Harley Goss (Saxo) s.t. 5. Matthe Pronk (Vacansoleil) s.t. 6. Danilo Napolitano (Katusha) s.t. 7. Graeme Brown (Rabobank) s.t. 8. Dominik Roels (Milram) s.t. 9. Timothy Gudsell (FDJ) s.t. 10. Alessandro Ballan (Lampre) s.t. 6. Marek Rutkiewicz (Poland) s.t. 7. Sylvester Szmyd (Liquigas) s.t. 10. Francesco Gavazzi (Lampre) s.t. Friday, August 7: Stage 6, Kroscienko nad Dunajcem - Zakopane, 162.2 km. 3. Marco Marcato (Vacansoleil) s.t. 4. Francesco Reda (Quick step) s.t. 5. Francesco Gavazzi (Lampre) s.t. 8. Pablo Lastras (Caisse d'Epargne) s.t. 9. Maxim Iglinsky (Astana) s.t. 10. Oliver Zaugg (Liquigas) s.t. 9. David Loosli (Lampre) s.t. Thursday, August 6: Stage 5, Strzyzow - Krynica Zdroj, 163 km. 3. Pieter Weening (Rabobank) s.t. 5. Marek Rutkiewicz (Poland) s.t. 6. Sylvester Szmyd (Liquigas) s.t. 8. Francesco Gavazzi (Lampre) s.t. 9. Mauricio Alberto Ardila (Rabobank) s.t. 10. Daniel Martin (Garmin-Slipstream) s.t. Wednesday, August 5: Stage 4, Naleczow/Wojciechow - Rzeszow, 239.7 km. 2. Jurgen Roelandts (Silence-Lotto) s.t. 3. Danilo Napolitano (Katusha) s.t. 4. Steve Chainel (Bouygues Telecom) s.t. 5. Igor Abakoumov (ISD) s.t. 9. Sebastien Chavanel (FDJ) s.t. 10. Michal Golas (Vacansoleil) s.t. 3. Jacopo Guarnieri (Liquigas) s.t. 4. Angelo furlan (Lampre) s.t. 5. Andre Greipel (Columbia) s.t. 6. Edvald Boasson Hagen (Columbia) s.t. 8. Laszlo Bodrogi (Katusha) s.t. Tuesday, August 4: Stage 3, Bielsk Podlaski - Lublin, 225.1 km. 2. Allan Davis (Quick Step) s.t. 3. Andre Greipel Columbia) s.t. 6. Jurgen Roelandts (Silence-Lotto) s.t. 7. Juan Jose Haedo (Saxo) s.t. 8. Maciej Paterski (Poland) s.t. 9. Graeme Brown (Rabobank) s.t. 10. Aitor Galdos (Euskaltel) s.t. 2. 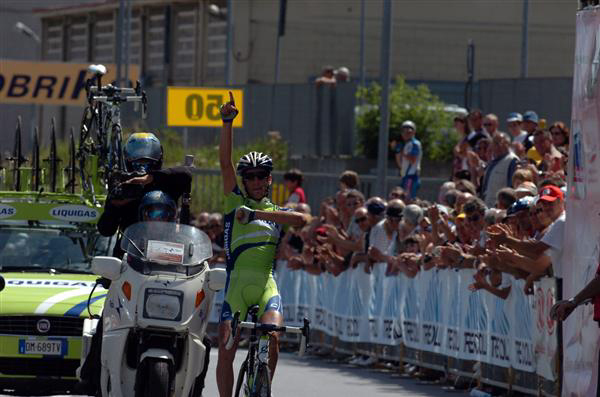 Jacopo Guarnieri (Liquigas) s.t. 3. Borut Bozic (Vacansoleil) s.t. 6. Laszlo Bodrogi (Katusha) s.t. 10. Bartlomiej Matysiak (Poland) s.t. Monday, August 3: Stage 2, Serock - Bialystok, 219.1 km. 1. 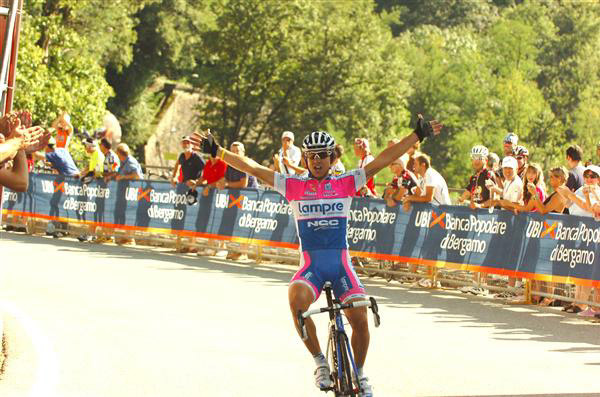 Angelo Furlan (Lampre) 4hr 57min 25sec. 44.2 km/hr. 3. Juan Jose Haedo (Saxo) s.t. 6. Andre Greipel (Columbia) s.t. 7. Robert Forster (Milram) s.t. 8. Sebastien Turgot (Bouygues Telecom) s.t. 9. Herve Duclos-Lassalle (Cofidis) s.t. 2. Angelo Furlan (Lampre) s.t. 7. Bartlomeij Matysiak (Poland) s.t..
Sunday, August 2: Stage 1, Warsaw. 9 laps of 12 km, total 108 km. 2. Andre Greipel (Columbia) s.t. 4. 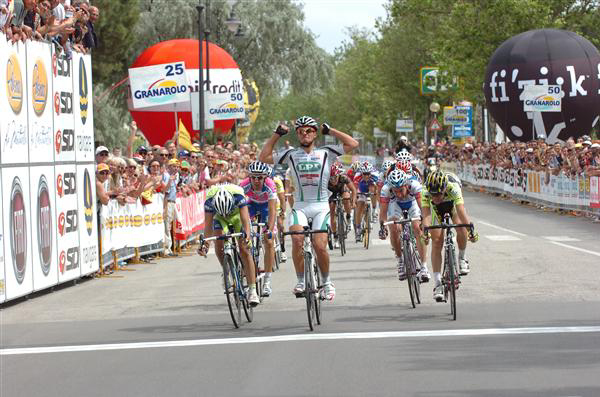 Jacopo Guarnieri (Liquigas) s.t. 5. Jurgen Roelandts (Silence-Lotto) s.t. 6. Christopher Sutten (Garmin-Slipstream) s.t. 7. Igor Abakoumov (ISD) s.t. 9. Maciej Paterski (Poland) s.t. 10. Steve Chainel (Bouygues Telecom) s.t. 4. Blazej Janiaczyk (Poland) s.t. 7. Jason McCartney (Saxo) s.t. 8. Andrea Sergio de Lis (Euskaltel) s.t. 10. Jurgen Roelandts (Silence-lotto) s.t. Sunday, August 2: La Poly Normande (1.1), France, 157 km. 2. Stefan Van Dijck (Wiilems Veranda) s.t. 3. Wesley Sulzberger (FDJ) s.t. 4. Bert De Waele (Landbouwkrediet) s.t. 5. Julien El Fares (Cofidis) s.t. 6. Freddy Bichot (Agritubel) s.t. 7. Daniele Colli (Carmiooro) s.t. 9. Loyd Mondory (Ag2r) s.t. 10. Renaud Dion (Ag2r) s.t. Sunday, August 2: Subida a Urkiola (1.1), Spain. 160.1 km. Saturday, August 1: Clasica San Sebastian (Pro Tour), Spain. 237 km. Sunday, August 2: 6th and Final Stage, Ringsted - Frederiksberg, 150 km. 2. Matti Breschel (Saxo) s.t. 3. Baden Cooke (Vacansoleil) s.t. 4. Klaas Lodewyck (Topsort Vlaanderen) s.t. 5. Gorik Gardeyn (Silence-Lotto) s.t. 6. Philip Nielsen (Concordia) s.t. 7. Maarten Neyens (Topsport Vlaanderen) s.t. 8. Kenny De Haes (Silence-Lotto) s.t. 9. Alex Rasmussen (Saxo) s.t. 10. Daniel Musiol (Vorarlberg) s.t. 5. Matti Breschel (Saxo) s.t. Saturday, August 1: Stage 5, 15.5 km Roskilde Individual Time Trial. 5. Jakob Fuglsang (Saxo) s.t. 6. Jens Mouris (Vacansoleil) s.t. Saturday, August 1: Stage 4, Korsor - Koge, 115 km. 2. Daniel Holm Fodor (Concordia) s.t. 4. Morten Voss Christiansen (Bluewater) s.t. 6. Mauro Abel Richeze (CSF) s.t. 7. Kenny De Haes (Silence-Lotto) s.t. 8. Lars Ulrich (Concordia) s.t. 9. Bernardo Riccio (Flaminia) s.t. 10. Matti Breschel (Saxo) s.t. 7. Rasmus Guldhammer (Capinordic) s.t. 8. Arnoud Van Groen (Vacansoleil) s.t. 10. Rene Jorgensen (Designa Kokken) s.t. Friday, July 31: Stage 3, Arhus - Vejle, 185 km. 3. Maurizio Biondo (Flaminia) s.t. 4. Nicki Sorensen (Saxo) s.t. 6. Jonas Ljunblad (Silence-Lotto) s.t. 8. Andreas Dietziker (Vorarlberg) s.t. 9. Allan Johansen (Designa Kokken) s.t. 10. Arnoud Van Groen (Vacansoleil) s.t. 7. Allan Johansen (Designa kokken) s.t. Thursday, July 30: Stage 2, Aars - Arhus, 190 km. 3. Martin Reimer (Cervelo) s.t. 4. Martin Pedersen (Capinordic) s.t. 5. Baden Cooke (Vacansoleil) s.t. 6. Jakob Fuglsang (Saxo) s.t. 7. Rasmus Guldhammer (Designa Kokken) s.t. 8. Allan Johansen (Designa Kokken) s.t. 9. Maarten Neyens (Topsort Vlaanderen) s.t. 10. Jeremy Hunt (Cervelo) s.t. 9. Lars Bak (Saxo) s.t. 10. Rene Jorgensen (Disegna Kokken) s.t. Wednesday, July 29: Stage 1, Hirtshals - Rebild, 175 km. 2. Simon Gerrans (Cervelo) s.t. 3. Martin Pedersen (Capinordic) s.t. 4. Kristoff Vandewalle (Topsport Vlaanderen) s.t. 5. Aleksejs Saramotins (Designa Kokken) s.t. 6. Rasmus Guldhammer (Capinordic) s.t. 7. Daniel Foder (Concordia) s.t. 3. Jeremy Hunt (Cervelo) s.t. 6. Thijs Van Amerongen (Vacansoleil) s.t. 8. Aleksejs Seramotins (Designa Kokken) s.t. 9. Rasmus Guldhammer (Capinordic) s.t. 10. Daniel Foder (Concordia) s.t. Wednesday, July 29: 5th and Final Stage, Ottignies LLN - Tournai, 172.9 km. 2. Joan Jose Haedo (Saxo) s.t. 3. Stefan Van Dijk (Verandas Willems) s.t. 4. Borut Bozic (Vacansoleil) s.t. 6. Wouter Weylandt (Quick Step0 s.t. 7. Marco Marcato (Vacansoleil) s.t. 8. Frederic Amorison (Landbouwkrediet) s.t. 9. Jurgen Roelandts (Silence-Lotto) s.t. 10. Ben Swift (Katusha) s.t. 6. Nicolas Jalabert (Agritubel) s.t. 7. Dries Devenyns (Quick step) s.t. 8. Mathias Frank (BMC) s.t. 10. Thomas De Gendt (Topsort Vlaanderen) s.t. Tuesday, July 28: Stage 4, Charleroi - Perwez, 195.1 km. 2. Pavel Brutt (Katusha) s.t. 6. Steven Caethoven (Agritubel) s.t. 8. Sergey Lagutin (Vacansoleil) s.t. 9. Johnny Hoogerland (Vacansoleil) s.t. 10. Yoann Offredo (FDJ) s.t. 9. Vincent Jerome (Bouygues Telecom) s.t. 10. Thomas De Gendt (Topsport Vlaanderen) s.t. Monday, July 27: Stage 3, Ciney - Thuin, 205.9 km. 4. Marco Marcato (Vacansoleil) s.t. 5. Alexandre Usov (Cofidis) s.t. 6. Kristof Goddaert (Topsort Vlaanderen) s.t. 7. Yoann Offredo (FDJ) s.t. 9. Bjorn Leukemans (Vacansoleil) s.t. 10. Alexander Kolobnev (Saxo) s.t. 5. Bert De Waele (Landbouwkrediet) s.t. 6. Marco Marcato (Vacansoleil) s.t. 7. Nicolas Jalabert (Agritubel) s.t. 8. Nikolas Maes (Topsort Vlaanderen) s.t. 9. Alexander Kolobnev (Saxo) s.t. 10. Alexandre Moos (BMC) s.t. Sunday, July 26: Stage 2, Limbourg - Arlon, 210.5 km. 2. Wouter Weylandt (Quick step) s.t. 4. Kristof Goddaert (Topsort Vlaanderen) s.t. 6. Borut Bozic (Vacansoleil) s.t. 9. Rene Mandri (Ag2r) s.t. 10. Gaullaume Le Floch (Bouygues Telecom) s.t. 2. Freddy Bichot (Agritubel) s.t. 6. Florian Stalder (BMC) s.t. 7. Bert De Waele (Landbouwkrediet) s.t. 8. 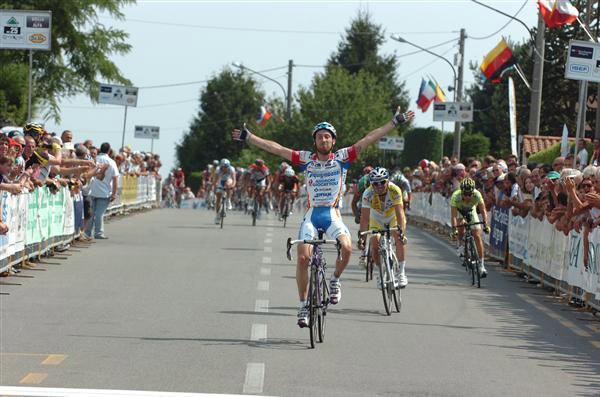 Rene Mandri (Ag2r) s.t. 9. Geert Verheyen (Landbouwkrediet) s.t. 10. Nicolas Jalabert (Agritubel) s.t. Saturday, July 25: Stage 1, Warreme - Beaufays, 177.3 km. 2. Stefan Van Dijk (Verandas Willams) s.t. 3. Ben Hermans (Topsport Vlaanderen) s.t. 4. Alexander Kolobnev (Saxo) s.t. 5. Yoann Offredo (FDJ) s.t. 6. Bert De Waele (Landbouwkrediet) s.t. 8. Andre Steensen (Saxo) s.t. 9. Nicolas Jalabert (Agritubel) s.t. 10. Florian Stalder (BMC) s.t. 6. Bert De aele (Landbouwkrediet) s.t. Wednesday, June 24: Giro dell'Appennino (1.1), Italy. 192.5 km. 3. Marco Marzano (Lampre) s.t. 4. Pasquale Muto (Miche) s.t. 6. Eros Capecchi (Fuji-Servetto) s.t. 7. Giampaolo Caruso (Flaminia) s.t. 8. Filippo Savini (CSF) s.t. 9. Domenico Pozzovivo (CSF) s.t. June 13 - June 21: Tour de Suisse (Pro Tour), Switzerland. June 7 - June 14: Critérium du Dauphiné Libéré (Pro Tour), France. Sunday, June 7: Philadelphia International Championship (HC), 156 miles. 2. Greg Henderson (Columbia) s.t. 4. Harald Starzengruber (Elk Hus) s.t. 5. David Vitoria (Rock Racing) s.t. 6. Kevin Lacombe (Planet Energy) s.t. 7. Alejandro Borrejo (Colavita) s.t. 8. Christofer Stevenson (Swedish Nat'l team) s.t. 9. Lucas Haedo (Colavita) s.t. 10. Andrew Pinfold (Ouch) s.t. Sunday, June 7: GP Kanton Aargau (HC), Switzerland. 196 km. 2. Ben Hermans (Topsport Vlaanderen) s.t. 5. Thor Hushovd (Cervelo) s.t. 6. Reiner Honig (Vacansoleil) s.t. 7. Maxime Bouet (Agritubel) s.t. 8. Simon Zahner (Swiss National Team) s.t. 9. Greg Van Avermaet (Silence-Lotto) s.t. 10. Pieter Vanspeybrouck (Topsport Vlaanderen) s.t. Saturday, June 6: Memorial Marco Pantani - GP Mercatone Uno (1.1), Italy. 183.7 km. 3. Valerio Agnoli (Liquigas) s.t. 5. Simoni Ponzi (Lampre) s.t. 6. Walter Proch (Betonexpressz 2000) s.t. 7. Andrea Moletta (Miche) s.t. 8. Domenico Moletta (Centri Della Calzatura) s.t. 9. Fabio Taborre (Serramenti PVC-Diquigiovanni) s.t. 10. Diego Alejandro Tamayo (Carmiooro) s.t. Saturday, June 6: GP Triberg - Schwarzwald (1.1), Germany. 150 km. 5. Christophe Moreau (Agritubel) s.t. 10. Peter Wrolich (Milram) s.t. June 3 - June 7: Tour de Luxembourg (HC), Luxembourg. May 27 - May 31: Bayern Rundfahrt (HC), Germany. May 18 - May 24: Volta a Catalunya (Pro Tour), Spain. 3. Nicolas Jalabert (Agritubel) s.t. 4. Dimitri Champion (Bretagne) s.t. 5. Luis Felipe Laverde (Colombia) s.t. 7. Biel Kadri (Ag2R) s.t. 8. Daniele Colli (Carmiooro) s.t. 10. Yukiya Arashiro (Bouygues Telecom) s.t. Sunday, May 3: Giro di Toscana (1.1), 193.4 km. Italy. 2. Manuel Belletti (Serramenti PVC-Diquigiovanni) s.t. 3. Ruggero Marzoli (Acqua & Sapone) s.t. 6. Miguel Angel Rubiano s.t. 7. Felix Rafael Cardenas s.t. 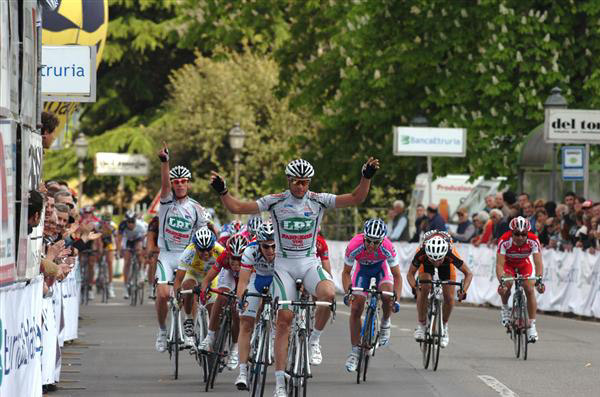 Saturday, May 2: Gran Premio Industria & Artigianato - Larciano (1.1), 200 km. Italy. 2. Gabriele Bosisio (LPR) s.t. 3. Jackson Rodriguez (Serramenti PVC-Diquigiovanni) s.t. 4. Daniele Pietropolli (LPR) s.t. 6. Tomaz Nose (Adria Mobil) s.t. 7. Franco Pellizotti (Liquigas) s.t. 8. Feliz Rafael Caedenas (Barloworld) s.t. 9. Przemyslaw Niemec (Miche) s.t. 10. Donato Cannone (Benton Express) s.t. Friday, May 1: Eschborn - Frankfurt City Loop (HC), 190.8 km. Germany. This was was formerly run as Rund um den Henniger Turm. 2. Karsten Kroon (Saxo) s.t. 5. Paul Martens (Rabobank) s.t. 9. Gerben Lowik (Vacansoleil) s.t. April 29 - May 3: SRAM Tour of the Gila (National), USA. Sunday, May 3: 5th and final stage, Gila Monster Road Race, 170 km/105.7 miles. 3. Levi Leipheimer (Mellow Johnny's) s.t. 6. Burke Swindlehurst (Bissell) s.t. 8. Christopher Baldwin (Boulder) s.t. 10. Florian Stalder (Team B) s.t. Saturday, May 2: Stage 4, Downtown Silver City Criterium, 43.2 miles/69.6 km. 2. Lucas Sebastian Haedo (Colavita) s.t. 3. Alex Howes (Felt) s.t. 4. Davide Frattini (Colavita) s.t. 5. Shawn Milne (Team Type 1) s.t. 6. Neil Shirley (Kelly Benefit) s.t. 7. Zach Watson (Athletes by Design) s.t. 8. Bradley White (OUCH) s.t. 9. Florian Stalder (Team B) s.t. 10. Chad Beyer (Team B) s.t. 11. Lance Armstrong (Mellow Johnny's) s.t. 10. Matt Cooke (RideClean) s.t. Friday, May 1: Stage 3, Dan Potts Memorial Tyrone Individual Time Trial, 16.15 miles/ 26 km. Thursday, April 30: Stage 2, Inner Loop Road Race, 80 miles/ 128 km. 2. Alex Howes (Felt) s.t. 3. Rory Sutherland (OUCH) s.t. 4. Philip Zajicek (Fly V Australia) s.t. 5. Mike Northey (Land Rover) s.t. 7. Alex Candelario (Kelly Benefit) s.t. 8. Taylor Phinney (Trek Livestrong) s.t. 9. Sheldon Deeny (Bissell) s.t. 10. Fabio Calabria (Team Type 1) s.t. 7. Rory Sutherland (OUCH) s.t. 10. Tyler Wren (Colavita) s.t. Wednesday, April 29: Stage 1, Silver City - Mogollon, 151 km. Stage and GC times and places are the same. 10. Scott Nydam (Team B) s.t. April 28 - May 3: Tour de Romandie (Pro Tour), Switzerland. Sunday, April 26: Liège - Bastogne - Liège (Historic), 261 km. Belgium. April 22 - April 25: Giro del Trentino (2.1), Italy. Wednesday, April 22: La Flèche Wallonne (Historic), 195.5 km. Belgium. Sunday, April 19: Amstel Gold Race (Pro Tour), 258.6 km. The Netherlands. Wednesday, April 15: Scheldprijs Vlaanderen (HC), 200 km. Belgium. 2. Kenny Van Hummel (Skil-Shimano) s.t. 3. Dominique Rollin (Cervelo) s.t. 4. Antonio Cruz (BMC) s.t. 5. Peter Wrolich (Milram) s.t. 6. Harald Starzengruber (Elk Haus) s.t. 7. Bjorn Schroder (Mlram) s.t. 8. Jose Antonio Carrasco (Andalucia) s.t. 9. Bernhard Eisel (Columbia) s.t. 10. James Vanlandschoot (Verandas) s.t. Tuesday, April 14: Paris - Camembert Lepetit (1.1), 202.7 km. France. 3. Alexander Efimkin (Ag2R) s.t. 6. Matteo Carrara (Vacansoleil) s.t. 7. Julien Simon (Besson Chaussures) s.t. 8. Anthony Geslin (FDJ) s.t. 9. Lilian Jegou (Bretegne) s.t. 10. Benoit Vaugrenard (FDJ) s.t. Sunday, April 12: Paris - Roubaix (Historic), 259 km. Sunday, April 12: Klasika Primavera (1.1), Spain. 171.6 km. 2. Egoi Martinez (Euskaltel) s.t. 3. Jose Herrada (Contentpolis) s.t. 4. Mikel Astarloza (Euskaltel) s.t. 7. David Blanco (Palmeiras) s.t. 8. Gorka Verdugo (Euskaltel) s.t. 9. Ezequiel Mosquera (Xacobeo) s.t. 10. Angel Vicioso (Andalucia) s.t. Wednesday, April 8: Gent - Wevelgem (Pro Tour), Belgium. 203 km. Podium history of Tour of Flanders. Saturday, April 4: Hel van het Mergelland (1.1), Netherlands, 190.0 km. 2. Federico Canuti (CSF) s.t. 4. Koos Moerenhout (Rabobank) s.t. 7. Tom Stamsnijder (Rabobank) s.t. 8. Marco Frapporti (CSF) s.t. Saturday, April 4: Gran Premio Miguel Indurain (HC), Spain. 191.4 km. 2. Alexander Kolobnev (Saxo) s.t. 4. Christian Pfannberger (Katusha) s.t. 6. Xavier Florencio (Cervelo) s.t. 10. Daniel Moreno (Caisse d'Epargne) s.t. 12. Luca Mazzanti (Katusha) s.t. Friday, April 3: Route Adélie de Vitré (1.1), France. 197.8 km. 3. Romain Feillu (Agritubel) s.t. 5. Lloyd Mondory (Ag2R) s.t. 6. Benoit Vaugrenard (FDJ) s.t. 7. Geoffroy Lequatre (Agritubel) s.t. 8. Anders Lund (Saxo) s.t. 9. Jean-Eudes Demeret (Cofidis) s.t. 10. Maxime Mederel (Auber 98) s.t. 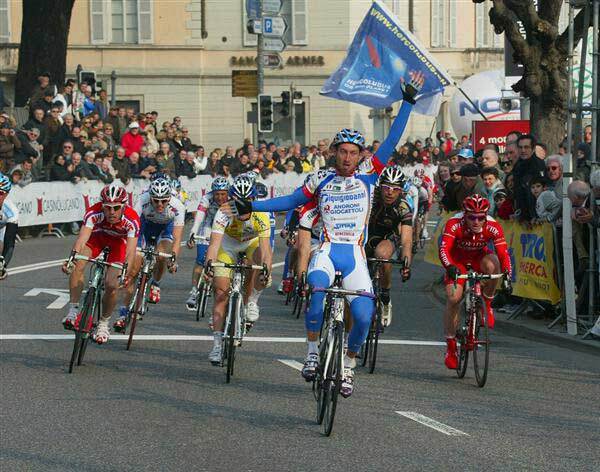 March 31 - April 5: Settimana Ciclistica Lombarda - Memorial Adriano Rodoni (2.1), Italy. Sunday, March 29: De Brabantse Pijl (1.1), Belgium. 193.5 km. 2. Jerome Pineau (Quick Step) s.t. 4. Bjorn Leukemans (Vacansoleil) s.t. 5. Karsten Kroon (Saxo) s.t. Sunday, March 29: Gran Premio de Llodio (1.1), Spain. 175.5 km. 2. David de la Fuente (Fuji-Servetto) s.t. 5. Aitor Galdos (Euskaltel) s.t. 6. Victor Hugo Pena (Rock Racing) s.t. 7. David Herrero (Xacobeo) s.t. 8. J. Alberto Benitez (Fuji-Servetto) s.t. 9. Andre Cardoso (Palmeiras Tavira) s.t. 10. Ricardo Serrano (Fuji-Servetto) s.t. Saturday, March 28: E3 Prijs Vlaanderen - Harelbeke (HC), Belgium, 208 km. Wednesday, March 25: Dwars door Vlaanderen (1.1), Belgium. 200 km. 7. Sylvain Chavanel (Quick Step) s.t. 8. Mathew Hayman (Rabobank) s.t. 10. Kristof Goddaert (Topsport Vlaanderen) s.t. Sunday, March 22: La Cholet Pays De Loire (1.1), France. 205 km. 2. Jimmy Casper (Besson Chaussures) s.t. 3. Alexndre Pichot (Bouygues Telecom) s.t. 4. Kevyn Ista (Agritubel) s.t. 5. Matteo Carrara (Vacansoleil) s.t. 6. Julien Mazet (Auber 93) s.t. 7. Steven Tronet (Roubaix) s.t. 8. David Lopez Garcia (Caisse d'Epargne) s.t. 9. Romain Feillu (Agritubel) s.t. 10. Jure Kocjan (Carmiooro) s.t. Sunday, March 22: Ronde van het Groene Hart (1.1), Netherlands. 203.4 km. 1. Geert Omloop (Palmans) 4hr 30min 43sec. 45.1 km/hr. 3. Aart Vierhouten (Vacansoleil) s.t. 4. Robert Forster (Milram) s.t. 10. Wouter Mol (Vacansoleil) s.t. Saturday, March 21, Milano - San Remo (Historic), Italy. 298 km. Podium history of Milano - San Remo. Wednesday, March 18: Nokere - Koerse (1.1), Belgium. 192.9 km. 2. Ben Swift (Katusha) s.t. 4. Bjorn Coomans (Palmans) s.t. 5. Denis Galizyanov (Katusha) s.t. 6. Maxime Vantomme (Katusha) s.t. 7. Dennis Pohl (Kuota) s.t. 8. Michael Reihs (Designa Kokken) s.t. 9. Alexei Markov (Katusha) s.t. 10. Niko Eeckhout (An Post) s.t. March 11 - March 17: Tirreno - Adriatico (Historic), Italy. March 8 - March 15: Paris - Nice (Historic), France. Saturday, March 7: Montepaschi Strade Bianche-Eroica Toscana (1.1), Italy. 190 km. Wednesday, March 4: Giro Del Friuli (1.1), Italy. 188 km. 1. Mirco Lorenzetto (Lampre) 4hr 38min 40.56 km/hr. 2. Grega Bole (Amica Chips) s.t. 3. Manuel Belletti (Serramenti PVC-Diquigiovanni) s.t. 4. 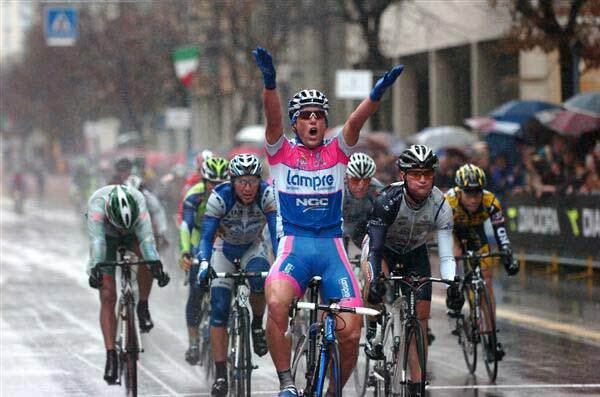 Alessandro Petacchi (LPR) s.t. 5. Mauro Finetto (CSF) s.t. 7. Antonio Murilo Fischer (Liquigas) s.t. 8. Pasquale Muto (Miche) s.t. 9. Massimo Giunti (Miche) s.t. 10. Patrick Calgani (Barloworld) s.t. Wednesday, March 4: Memorial Samyn (1.1) Belgium. 191.9 km. 2. Remy Cusin (Agritubel) s.t. 6. Jeremie Galland (Besson Chaussures) s.t. 7. Jan Bakelants (Topsport Vlaanderen) s.t. 8. Florian Vachon (Roubaix) s.t. Sunday, March 1: GP di Lugano (1.1), Switzerland. 178.5 km. Sunday, March 1: Clasica de Almeria (1.1), Spain. 165.6 km. 4. Javier Benitez (Contentpolis) s.t. 6. Vincent Jerome (Bouygues Telecom) s.t. 7. Tony Martin (Columbia) s.t. 8. Luis Leon Sanchez (Caisse d'Epargne) s.t. 10. Josep Jufre (Fuji-Servetto) s.t. Saturday, February 28: Gran Premio Dell'Insubria (1.1), Italy & Switzerland. 173 km. 5. Carlo Scognamiglio (Barloworld) s.t. 6. Francisco Jose Ventoso (Carmiooro) s.t. 7. Fabian Wegmann (Milram) s.t. 8. Simon Clarke (Amica Chips) s.t. 9. Mauro Santambrogio (Lampre) s.t. February 24 - February 28: Giro di Sardegna (2.1), Italy. Saturday, February 21: Trofeo Laigueglia (1.1), Italy. 176.1 km. February 21 - February 22: Tour du Haut Var (2.1), France. February 18 - February 22: Volta ao Algarve (2.1), Portugal. February 15 - February 19: Vuelta a Andalucia - Ruta Ciclista Del Sol (2.1), Spain. February 11 - February 15: Tour Méditerranéen Cycliste Professionnel (2.1), France. February 9 - February 15: Le Tour de Langkawi (HC) Malaysia. February 8 - February 12: Challenge Illes Balears - Volta Ciclista a Mallorca. Saturday, February 7: GP Costa degli Etruschi (1.1), Italy. February 4 - February 8: Etoile de Bessèges (2.1), France. Sunday, February 1: GP d'Ouverture - La Marseillaise (1.1), 136.8 km. France. Sunday, February 1: Elite Mens' Cyclocross World Championships, Hoogerheide, Netherlands. 6. Kevin Pauwels (Belgium) s.t. 8. Simon Zahner (Switzerland) s.t. 9. Steve Chainel (France) s.t. 10. Klaus Vantornout (Belgium) s.t. January 19 - January 25: Tour de San Luis (2.1), Argentina. 8. Ben Maynes (Bissell) s.t.